Clear skies. Low near 30F. Winds W at 5 to 10 mph..
Clear skies. Low near 30F. Winds W at 5 to 10 mph. Bottles of CBD juices, which can be used in vaporizers amd e-cigarettes, line the shelves at Zombies Smoke Shop, April 5. 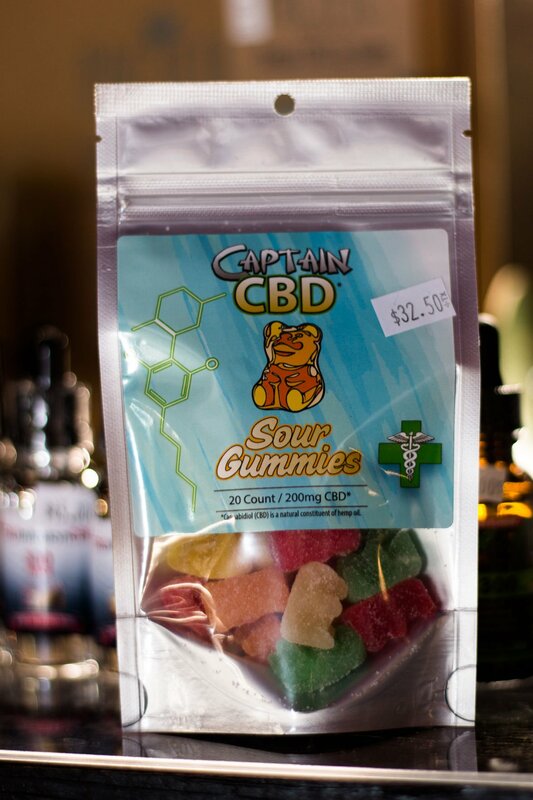 CBD gummies are just one of the CBD products offered at Zombies Smoke Shop, April 5. Amanda Costea, owner of Zombies Smoke Shop, helps a customer, April 5. Cannabidiol, also known as CBD, is a non-psychoactive derivative of cannabis that has found its way into many consumer oils, creams, candies and drinks. Many of its users claim the chemical helps relieve pain, stress, sleeplessness and a number of other ailments. According to an article from CBS News, CBD is primarily sold online and is extracted from specially grown cannabis plants. CBD is rendered from a plant called hemp, which was recently legalized in late December 2018. Hemp was reclassified under federal law as a low tetrahydrocannabinol (THC) yielding form of cannabis and cannot contain more than 0.3%. THC is the active ingredient in marijuana that gets users high. Senior James Megley said he has developed a fascination for CBD and its potential uses. Megley saw a lucrative opportunity in the chemical and began selling it to online customers late last year. Megley said his parents were the ones who introduced him to the potential benefits of CBD. He said his mother is a nutritionist and recommended CBD to many of her patients even before the chemical was legalized in the United States. Megley said he’s seen many people benefit from using CBD as opposed to prescription drugs to alleviate certain conditions. He mentioned David Wells, a pitcher for the New York Yankees, as one example. Some users claim CBD can even work as a dual-action solvent. Megley said one of his friends used it for multiple issues and found relief in all areas. Freshman Ashley Scholz said she started using CBD last year after a doctor in alternative medicine recommended it to her. She said she uses it to help alleviate her anxiety and symptoms of a disease called hyperthyroidism, which can cause accelerated metabolism and severe weight loss in humans, according to the Mayo Clinic. Scholz said CBD has affected her life in a positive way, and that she has never experienced negative side effects from using it. However, she is concerned about the purity of the product. Megley said CBD is versatile and can be ingested in a variety of ways. Scholz said her favorite CBD tincture comes in liquid form and packaged in a dripper bottle. She said she applies the liquid directly onto her tongue. “My go-to CBD product is called Suthe,” Scholz said. “I typically use two drops on my tongue each day, which is one full dosage.”. Senior Olivia Emele said she uses CBD products to ease her back pain. Emele started using CBD as an alternative to ibuprofen and other over-the-counter painkillers. According to Learn Sativa University, an Orlando-based institution dedicated to teaching students about cannabis cultivation and medical use, there can be negative side effects to CBD usage. Fatigue, diarrhea and changes in appetite are a few of the cited examples. Emele said she hasn’t experienced any of these symptoms. She sees negative stigmas surrounding the use of CBD as its major drawback. Emele said she uses a CBD shea butter product at least once a week or up to several times per day, if necessary. She said she’s found CBD products that pinpoint specific relief areas. With controversy surrounding the legalization of marijuana in the U.S., it seems the benefits of CBD have the potential to sway public opinion on the plant. For now, students interested in learning more about CBD and its uses can visit the Food and Drug Administration’s website.